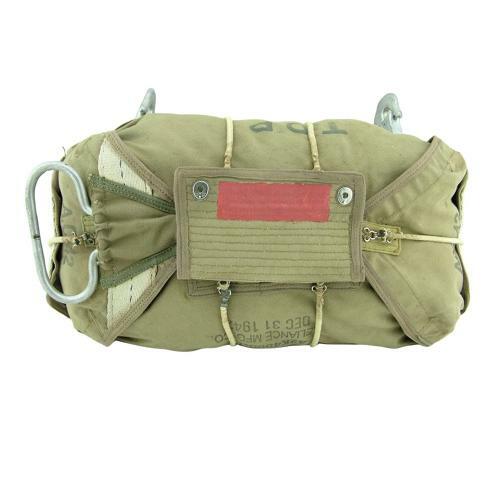 Parachute Assembly, Quick Attachable Chest, Type AN-6513-1A. Manufactured by Reliance. Dated December 31 1942. Group 1 'Red' pack for the quick attachable chest type parachute harness. Red painted patch on the ripcord flap indicating that this is a Group 1 pack complete with cadmium plated snap hooks for attaching to loops on the harness. Also fitted with correct ripcord handle/ripcord and bungees. Marked with serial number, clear manufacture date etc. The pack itself is empty (stuffed for photographing only). The AN6513-1A is a rectangular pack and differs from the AN6513 and AN6513-1 which are characterised by the unusual square shaped pack. Good used condition overall. Stock code S22947.